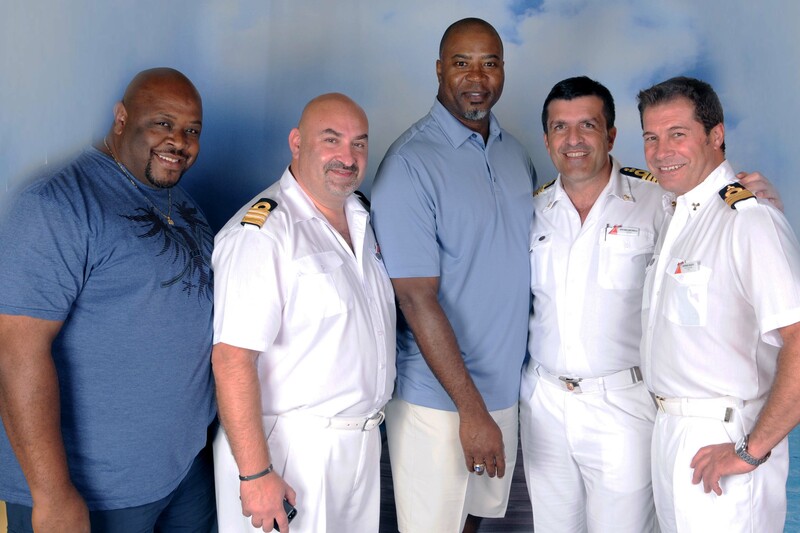 During a recent six-day Caribbean cruise, Carnival Breeze welcomed a special guest – NFL legend Chris Doleman, who was inducted into the Pro Football Hall of Fame last year. During his 15-year career with the Minnesota Vikings, Atlanta Falcons and San Francisco 49ers, Doleman was named to eight Pro Bowls and recorded 150.5 quarterback sacks, the fourth highest total in NFL history. He now runs Celebrity Charitable Network (www.CelebrityCharitableNetwork.com), a platform that allows celebrities, athletes, companies and non-profits access to the tools and knowledge they need to help them make a significant impact in their fundraising and social good efforts. Doleman (center) is pictured here with comedian Thomas Brown (far left) who performs in the Carnival Breeze’s Punchliner Comedy Club; and Carnival Breeze’s Hotel Director Pierre B. Camilleri (second from left), Captain Stefano Battinelli (second from right) and Chief Engineer Antonio Colotti.